Doing a certificate course is more often than not a great way for students and job aspirants alike to acquire new skills and add more value to their professional profile. Yet many don’t opt for them because of various concerns ranging from inconvenient timings to exorbitant fees. But what if we told you that today there is no dearth of short-term, professional online courses with certificate covering a plethora of disciplines (business, marketing leadership, hospitality, digital marketing, media, finance etc.) available to you — FREE-OF-COST — or a small fee in some cases. Yes, it’s true. And what’s more many of them are supported by some of the biggest names in quality education from India and abroad – making them even more credible and desirable for those seeking an additional qualification on their Resume. So here’s an up close and personal look at some of the best options available to you – in case you were planning to enroll for a free online certification course, but didn’t know where to look. An open-source, non-profit online learning destination and MOOC provider, edX was founded by the acclaimed Harvard University and MIT in 2012. It offers a slew of high-quality online courses from some of the world’s top universities (IIM-Bangalore, MIT, Berkeley, Harvard) to people from across the world. To access the available free certification courses presently available on edX, log onto to www.edx.org – choose a course – then search for the Audit This Course option. Another well-known proponent of online learning and free digital education, Udacity’s nano-degree programs are accessible to anyone on the planet, with a reliable internet connection and a strong desire to learn. Founded by former Stanford instructors – Sebastian Thrun and Peter Norvig – Udacity today offers a host of programs spanning Artificial Intelligence, Blockchain, Digital Marketing, Data Analysis, Deep Learning, Google AdWords, Machine Learning and Predictive Analytics (for Business). To know more about the free course options available @ Udacity, log onto udacity.com. Udemy is a global marketplace for e-learning and teaching online where students learn new skills and go about achieving their goals by learning from an extensive portfolio of library of over 80,000 courses taught by expert instructors from across the world. The tutorials and online courses created by their pool of academic experts are highly regarded, well curated and updated regularly – making Udemy a popular online destination for students and professionals looking for free and affordable certificate courses online, from across industry verticals. How to start a Recruitment Agency at Home. To access & know more about the free certificate course options at Udemy, log on to udemy.com. Coursera provides people with guaranteed access to cutting-edge education by virtue of its tie-ups with leading global universities and organisations, to offer a slew of result-oriented courses online. With flexible start dates, adjustable due dates, and easy to use mobile apps, Coursera has created an intuitive learning experience designed to enable an individual master real-world skills relevant to his career from the get go. A majority of the courses available here are free, albeit for a short duration. How it works is a person first selects a course he/she may be interested in and enrolls free of cost. If after a few days, the student wants to complete the course and earn a certificate – he is expected to pay for it. If not, he can continue till the end of the trial period and then has to exit. To know more about the various free online courses with certificates at Coursera log onto to www.coursera.org. Skillshare is an online learning community which offers thousands (16,000-plus) classes in design, business, technology, writing, crafts and more. Anyone can join the millions of members in this online community to learn cutting-edge skills, network with peers and discover new opportunities. The teaching faculty here consists of leading designers, marketers, entrepreneurs, programmers and artists with years of rich experience in their respective fields. Amazingly it offers students access to all its online training course – free of cost – for a period of two months. However sharing your credit card details is required for free access, though the company states that you won’t be billed a rupee and you can cancel anytime you choose. After the two month period, you may continue or cancel your subscription as you deem fit. Intro to UX – Fundamentals of Usability. SEO Today – Strategies to Earn Trust, Rank High and Stand Out. Based out of the United Kingdom, FutureLearn has reportedly changed the life of approx. 7, 5000,000+ students and working professionals worldwide by updating their knowledge and skills. Wholly owned by The Open University, the company has partnered with 144 leading universities, cultural organizations and professional bodies to offer a choice of 247 high quality certificate courses covering different specializations. These include; Business & management, Creative Arts & Media, Nature & Environment, Law, History, Tech & Coding, Teaching, Health & Psychology and Literature among others. In addition to free courses, students also get an opportunity to specialize in individual subjects and/or pursue post graduate degrees if they so desire. Finance Fundamentals: Financial Services after the Banking Crisis. For more details on the free courses available log on to futurelearn.com. National Programme On Technology Enhanced Learning (NPTEL) is a project that receives financial support from the Ministry of Human Resource Development of India. This project provides e-learning through the internet and video course in different fields like Humanities, Management, Technology, Science and Engineering. It is a curriculum building exercise and it is directed towards offering learning materials in science and engineering by following the syllabi of the AICTE and slightly modified syllabus of major affiliating universities. Video and online courses intending learners and lecturers of institutions conducting under graduate level courses in the field of education are offered under this project. Each course offered for free under this project comprises of nearly 40 video lectures that extend for about one hour duration. An internet-based discussion forum is also incorporated for enabling students to post comments and for reviewing questions. Wherever needed self evaluation tasks, handouts and course assignments are integrated. Also, workshops are regularly conducted for mentors, students and for institutes. Effective sales skills – How to be a successful salesperson? Like these, many other free and paid online courses are offered by this institution to help out people, who wish to improve themselves in their career. If you are interested in astrology, you can enroll yourself for a basic online astrology course offered for free by Cyberastro.com. The great thing about this course is that you need not have any prior knowledge about astrology to join. It extends for a period of four months and it is absolutely free for the registrants of this website. 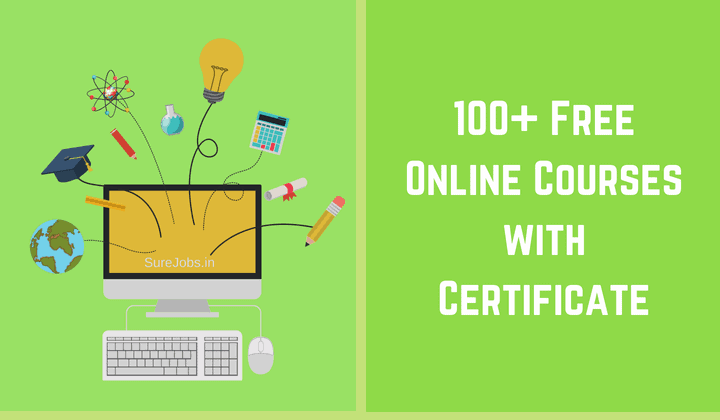 While doing a free certification / skills up gradation course online is now a quality option that has been leveraged by millions across the world, it’s really up to each one of us on how, when and why we decide to pursue such an online course. Doing it while pursuing an academic diploma/degree or just before the beginning of one’s career is always a preferred option since it adds immense value to a candidate’s profile. All that the student/professional needs to do is to select the appropriate subject and platform, register himself for these free online courses and take the plunge. I am intrested your course. Its really good work u r all doing in education field . I am also interested in to learn thisthis NPTEL cource please inform me. How may I get this education. I am interested in National Programme On Technology Enhanced Learning how do I get to be enrolled? Really very very good info .as am working professional am interested in learing this site given me a good start up again. Thanks to surejob admin.